From climate change to internet freedom to Millenials killing everything from the housing market to the diamond industry to the word “Millenial,” it’s easy to feel like somewhere along the way, someone sprinkled all of us with a little Chinese curse dust. Thank goodness for history, which offers perspective in times like these. It’s safe to say there hasn’t been a truly quiet, tranquil, boring time since the first shots of the Revolutionary War were fired at Lexington in 1775. And that’s just the American-centric view of things! There have been wars and coups and natural disasters and who knows what else across the globe since the dawn of time. “To defend our freedom and way of life, some generations of Americans are called to go to war; this generation was being called to import hippopotamuses and eat them,” writes Jon Mooalem in Atavist Magazine. Mooalem’s magazine #longread on the two men at the center of this innovative, daring, more-than-slightly crazy plan is absolutely astounding. If you’ve got an afternoon (or a few,) curl up with some “Lake Cow Bacon” and give it a read. The two men — one, a spy, the other, a war hero — were mortal enemies brought together for a brief moment in time by the allure of hippopotamus meat. But back to the history part they never taught you in school: the United States seriously considered importing hippopotamuses to the swamps of Mississippi and Louisiana to serve as a source of food. Congress considered a bill that asked for $250,000 to “import useful animals” into the United States. It became known as the Hippo Bill. I think this is as good a time as any to break in and remind you that hippos are terrifying swamp monsters that are nothing to mess around with. They’re the third largest land mammal in the world, with an average male hippo weighing over 3,000 pounds. They are vicious, unpredictable and aggressive. They’re vegetarians, but they attack other animals (and humans, given the chance) for sport. So, yeah, let’s just dump them in the swamps and see what happens. Perhaps by this point, you’ve realized that you don’t often see hippo meat on the menus here in the United States. Despite the political support and the House report and the popular excitement over the plan, it never came to fruition. Not a single hippo was ever brought to the United States for consumption. No 3,000 pound river horse was deposited in the bayous outside Baton Rouge. No lake cow bacon ever graced a plate at the nation’s finest dining establishments. For such a wild plan, it died without much fanfare. The bill was voted down in Congress, and the start of World War I distracted everyone from the great hippo caper of 1910. The seemingly insurmountable challenge facing America at that time was solved, not by hippos, but by a wartime economic boom and the long-term industrialization of agriculture. Mooalem reflects that — though the problem was dire and the consequences potentially life-threatening — the Hippo Bill and the Meat Question in fact brought out the best of America. From great struggle comes great ingenuity. From great conflict comes great respect. From great fires emerge great phoenixes. 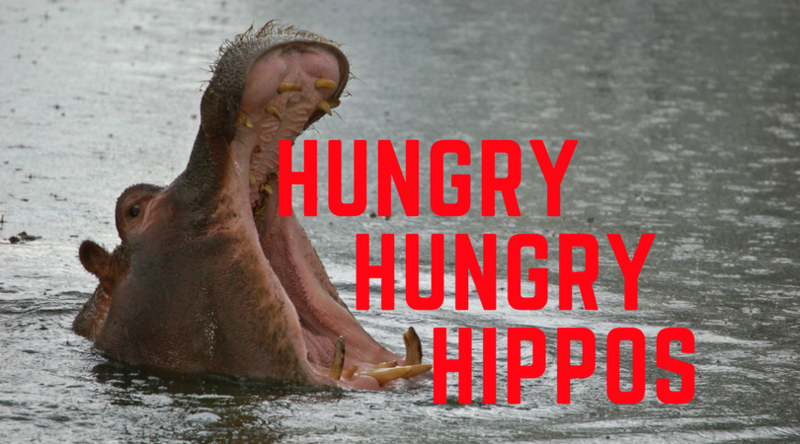 From great hunger comes great hippos. Which all makes me think … with everything happening in the world today, there must be something really fantastic waiting right around the bend. Right? RIGHT?